There are some peaks that hold so much allure for me that I am essentially fixated on them when we're camping nearby. When we're visiting Colorado Springs, for example, my eyes search for a glimpse of Pike's Peak whenever I'm outside. Ditto for Mts. Elbert and Massive when we are in Leadville. All three peaks so dominate their respective landscapes that they are hard to miss. Sunrise brightens the summit of Mt. Elbert (L) and the left side of Mt. Massive (R). 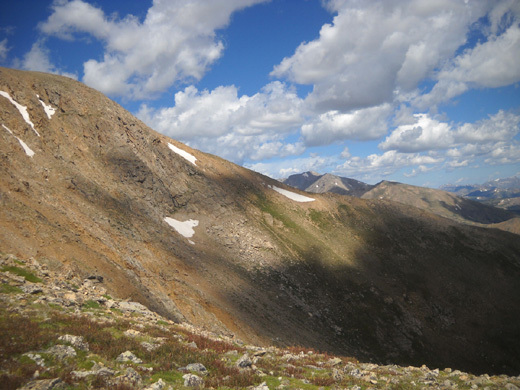 The prominent ridge facing this direction on Elbert is where I ascended today. I'm eager each year to get back out to climb to their summits. Before I get the opportunity I think, "I've been all the way up there before -- I wonder if I can do it again?" At my age and with bum knees, I don't take it for granted that I'll be able to climb 14ers forever. After I've climbed them once more I stare at them from far below and think, "Wow -- did it again! I was all the way up there on that point yesterday!!" Mt. Elbert summit this morning: chalk up another ascent! From the valley the summits always look impossibly far away even though I've been up to each of them several times. What's especially gratifying is to look out in the distance to Pike's, Elbert, Massive, and other 14ers I've climbed (and lower peaks, too) and realize I got up there under my own power. I had that same experience on my two journey runs (Appalachian Trail and Colorado Trail) when I'd look behind me and see a string of ridges I'd already hiked. It's an awesome feeling. I've climbed Mt. Elbert more times than Mt. Massive. 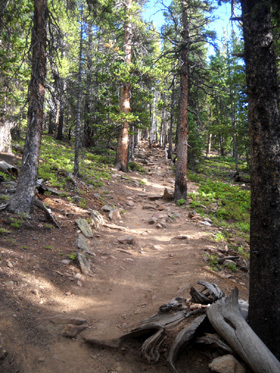 I prefer the trails on Elbert so I chose to hike it today. If I have time and the weather cooperates, I may also climb Massive again before we leave the area. 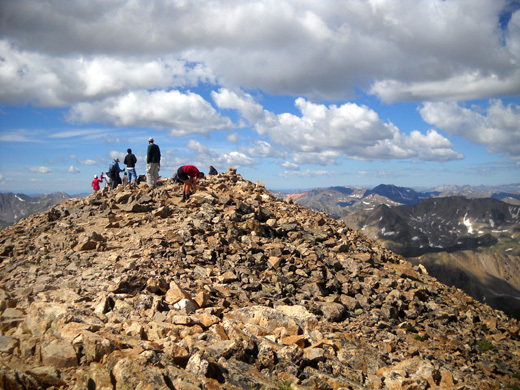 Elbert has the allure of being the highest peak in Colorado (14,433 feet) and the second-highest peak in the Lower 48 states. 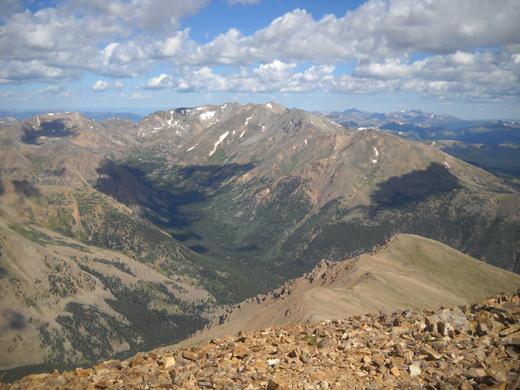 Massive, which lies just to the northwest of Elbert, has five summits over 14,000 feet. 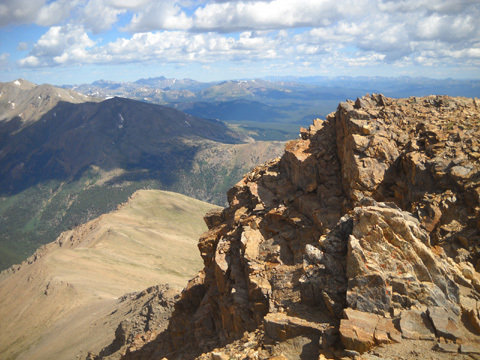 Its highest point (14,421 feet) is the second-highest peak in Colorado. View from Mt. Elbert's summit north to Mt. Massive; "massive" is right! 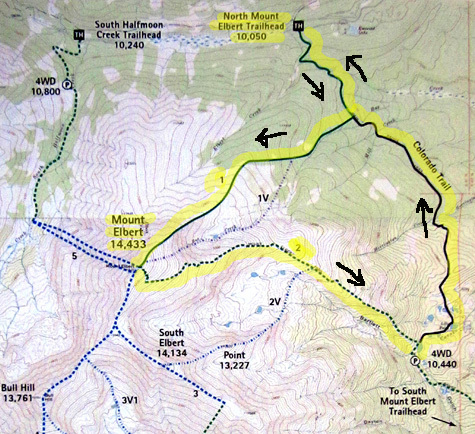 There are five major trails on Mt. Elbert. The two easiest and most popular are on the east side of the mountain facing the valley with US 24. 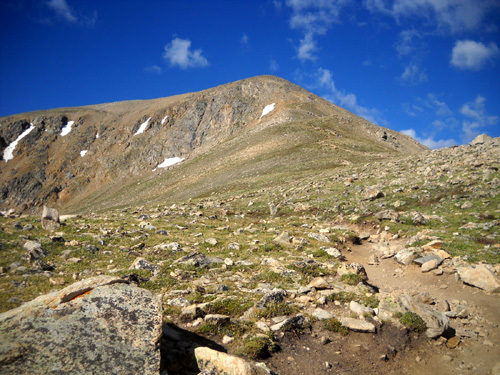 My favorite way to ascend Elbert is on the NE face via access off the Colorado Trail from Halfmoon Road. It's a relentless climb with some steep grades and lots of rocks but it is rated as a Class I (easy) route. Keep in mind that any route up this mountain will involve an ascent of about 4,000 feet in four or five miles -- at high altitude -- so it's no piece of cake unless you're already acclimated and trained for rather rough mountainous terrain. You don't need any climbing equipment, however. I like this trail for several reasons. One is that I can't see the summit until I'm very close to it. Popping over the last ridge and suddenly seeing the very top is always a nice reward for the effort to get there. 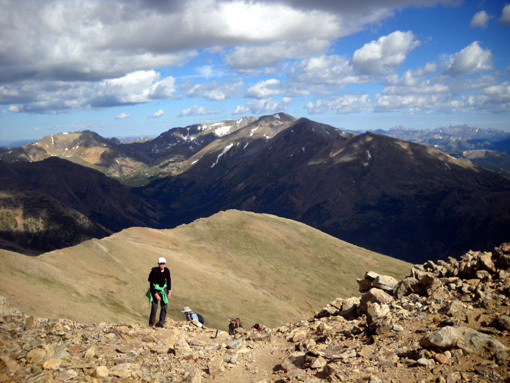 This route is the only way I've ever climbed to Elbert's summit. Because of my knees, however, descending that steeper, rockier route with loose scree is harder for me now. I knew from topo maps and visual observation from the NE ascent -- you can see parts of each trail from the other -- that the grade was a little easier on the East Trail from Twin Lakes but I didn't try it until my knees really deteriorated a few years ago. Going up the NE slope; note the large cirque (bowl) to the left. This is a view of the same cirque that I took from the other side (the east slope) as I descended. On my ascent I could see some remaining snowmelt at the bottom of the cirque. The ridge on the other side of the cirque is the one that goes SE toward Twin Lakes. 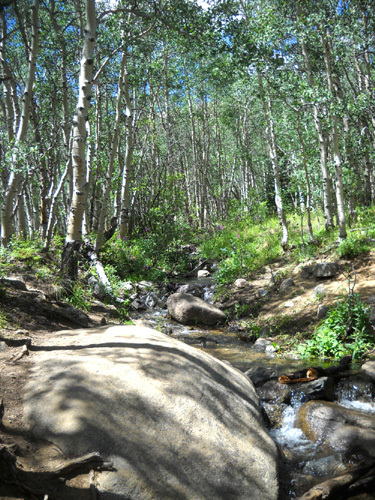 What works well for me now is to hike up the NE side, down the east side, then return to the trailhead on Halfmoon Road via the Colorado Trail. I've highlighted those trails on the map below. Gerry identifies the NE route as "Northeast Ridge II" and it is marked with #1 above. He calls the eastern route "East Ridge II;" it is marked #2 above. 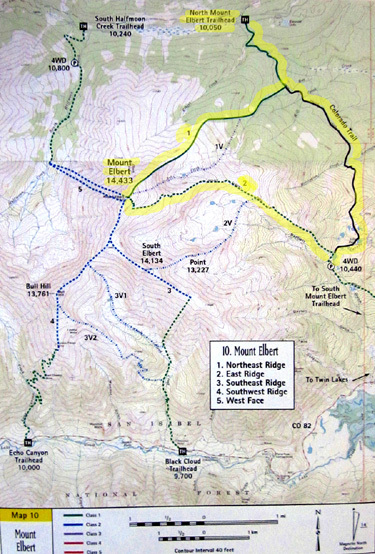 The National Forest Service calls these two popular routes North Mt. 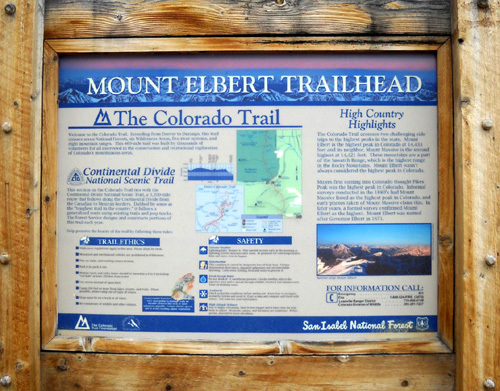 Elbert Trail and South Mt. Elbert Trail. Since there are other trails on the south side of the mountain I'll use Gerry's NE and East designations. 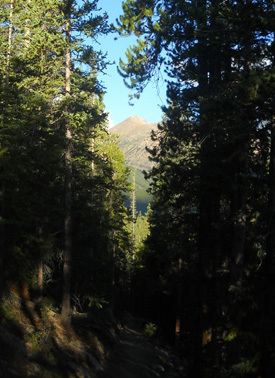 Note that the Colorado Trail is to the right, running predominantly north-south. I started/ended at the top of the map at the north Mt. Elbert trailhead. I call this the "Elbert Triangle" hike. Maybe I should call it a loop? The total distance is about 14 miles, which I can still manage in a day hike even though I can no longer run any of it. Correction -- shouldn't run any of it. I still do a little bit of running here and there. Jim and I got up at 5:30 AM so I could get an early start on my hike. It was 46 F. on our thermometer in Leadville, elevation 10,200 feet. I'd be going up to 14,433 feet, where it's colder. 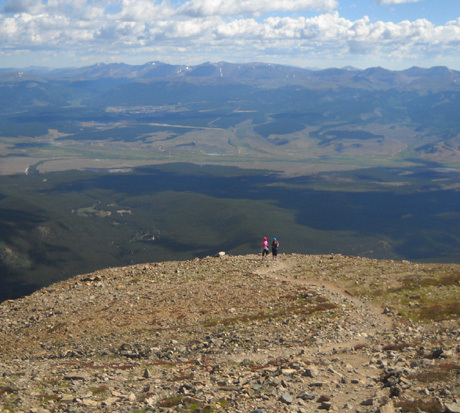 Despite a 30% chance of rain in Leadville it didn�t rain in the valley or on the mountain. Highs were mid-70s in Leadville (50s or 60s on the summit) and it was mostly sunny all day with low humidity. 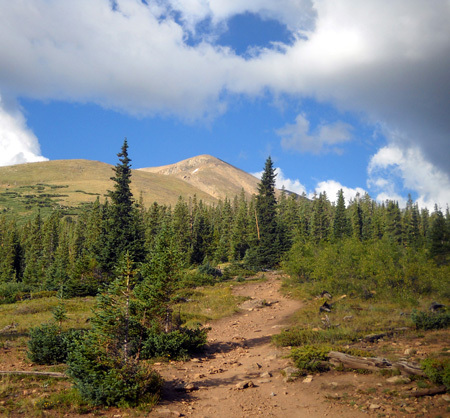 There were lots of billowy white clouds and some breeze all day � great weather for a hike on Elbert or any other nearby mountain! 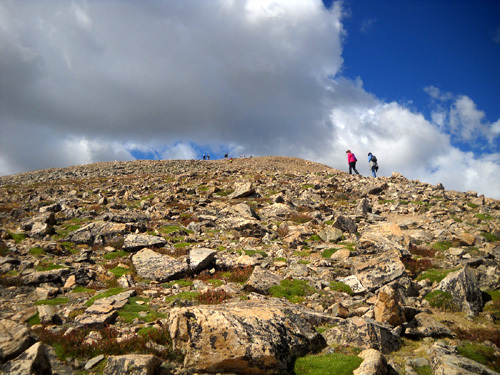 Several hikers are silhouetted against the sky and clouds as we all ascend Elbert's NE face. 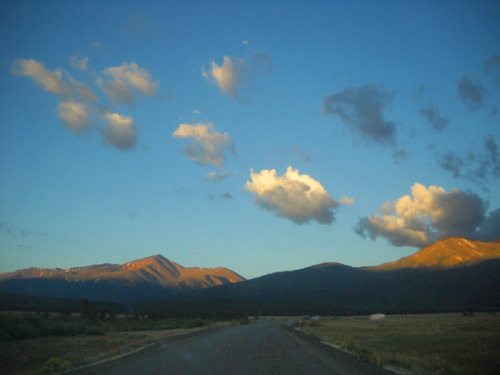 Jim and I drove out Halfmoon Road (FR 110) to the North Elbert Trailhead. That road is awful with all the bumpy �corduroy,� the worst I've ever seen it. Since the military helicopter crash on the side of Mt. Massive that killed some troops a couple years ago Halfmoon Road is no longer used in the LT100 foot race; runners have been rerouted to the �pipeline� and are now on the Colorado Trail fewer miles, too. We got out to the trailhead about 6:45 AM and left the truck there. The parking area was already mostly full -- that early on a Wednesday morning! 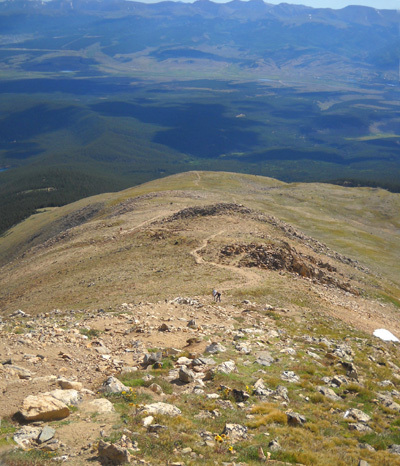 I doubt everyone was hiking or running up to the Elbert summit; some were probably hiking, running, or cycling only on the Colorado Trail (CT), which runs contiguously in this area with the Continental Divide Trail (CDT). Jim took his mountain bike in the truck with us and left soon after I did. He rode his bike back to the camper, a distance of 13 miles, on dirt and paved Forest Service and county roads. When I got done hiking I drove the truck home. If memory serves, Cody's been up there with me every previous time I've climbed Elbert in the last eight years (i.e., since we got him). I didn�t take him this time. He can do the distance but there just aren't enough natural sources of water on this route for him to get enough to drink for as long as I knew we'd be out there. Last year Cody and I ran out of water on this same hike even though he was carrying two liters in his pack and I gave him some of mine; I didn't want that to happen again. I figured it would take me even longer this year since I'm getting slower as I get older. It didn't take me any longer this time, but the lack of water would still have been a big problem. The last five miles on the CT there are several streams. It was the nine miles with no streams I was concerned about. I knew Cody would have to go about six hours between creeks. He requires about twice the amount of water I do -- especially on a sunny day at high altitude -- and between the two of us, we can�t carry enough for that long. In addition, he hasn�t been wearing his pack much this summer and I didn�t want to weigh him down with more than two liters of water (that amount would last him only 2-3 hours). Now I'm higher during my ascent. If you take a dog up Mt. Elbert or any other mountain consider the distance you'll be going, the location of streams, and the time you think it will take you. Then take more water with you (for yourself and your dog) than you think you'll need for the space between water sources. 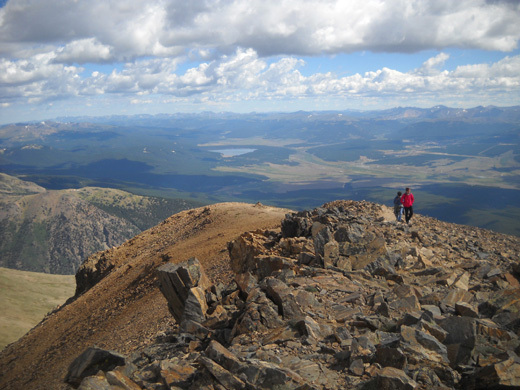 This was another consideration regarding Cody: neither of us has been over 12,600 feet elevation yet this summer. This hike is almost 2,000 feet higher than that. 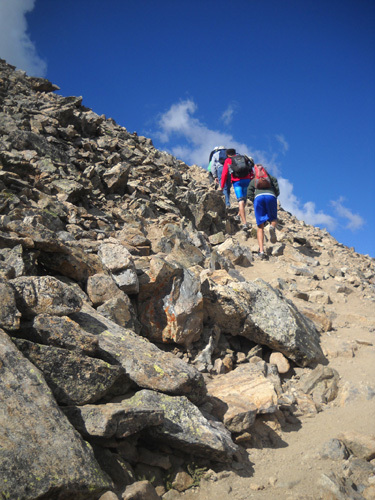 We had a lot more mountain training last year before this triangle hike, including two 14ers before Elbert and more high-altitude training in the Bighorns and San Juans in June and July. 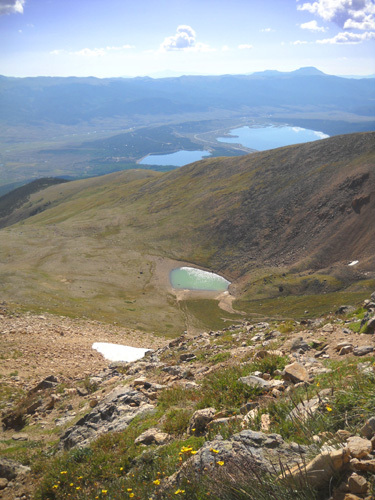 Turquoise Lake and Leadville are in the distance. Even so, it took me about the same amount of time this year as last -- 8:15 hours. When you find out how many pictures I took you'll wonder how I got back down before dark! It would have taken me a little longer with Cody (getting him water, mostly, and moving him off the trail when others went by). I got to the summit about 10 minutes faster this year than last, spent the same amount of time up there (35 minutes), and took a little longer on the descent and Colorado Trail. Even though I wasn�t trying to �compete� with anyone, I managed to pass fifteen people on the way up, most of them younger than me and most in the last mile. And that's with taking a gazillion pictures along the way!! Only two young men passed me on the way up (none down). That's gotta make a 62-year-old woman feel good, eh? Looking back down on the group I just passed; Mt. Massive's multiple peaks are in the background. Keep going -- photos and narrative continued on the next page so the pictures load faster . . .